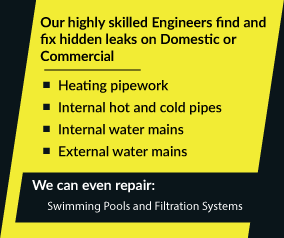 Our engineers are trained to provide you with the most non-invasive leak detection process as is humanly possible. The range of advanced leak detection equipment we use means that we can find leaks anywhere above or below ground on your property. And as an added bonus we offer very competitive pricing for the very high standard of service that we offer. For anyone living outside of the above areas don’t worry we provide our services to the entire United Kingdom. Call ADI now on 08007313843 and one of our professional and friendly staff will be glad to discuss your next steps with you.